Yesterday I popped along to St Chad’s Cathedral, which is a very interesting building so I’d recommend you follow that link. I was there to meet Sian Hindle, a jewellery designer who was taking part in the Architectural Jewellery and Conceptual Design strand of New Generation Arts and Architecture Week. This project, curated by Susan McNally, gets four designer-makers to work with a building of architectural interest in Birmingham. As well as St Chads there’ll be work in the Central Library, Big Peg in the Jewellery Quarter and Moor St Station. 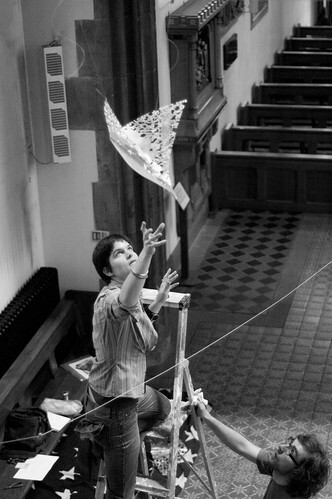 Sian has produced six birds from a sheet of metal which has been acid etched with a dream story about flight. 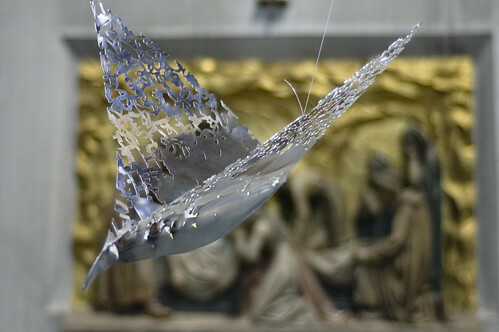 The birds are then suspended in the air at St Chads – you’ll find them in the far right corner. Sian graduated from BIAD a couple of years ago and now works in the Jewellery Quarter as a jewellery designer. She can be contacted here. The show officially starts on Monday 18th and runs to the 29th but if you’re passing you can obviously see Sian’s work right now during cathedral opening hours (8am – 5pm). The other installations are going in over the next few days. And it goes without saying the cathedral is well worth a visit on its own. Be sure and check out the 15th Century Christ.